From reed boats, papyrus, and amulets to pyramids, pharaohs, and mummies, this interactive activity book explores the fascinating lives of ancient Egyptians with more than two dozen hands-on projects. The text covers ancient Egyptian food and housing, games and toys, farming, medicine, clothing and jewelry, as well as gods, pharaohs, hieroglyphs, pyramids, temples, and mummies. Engaging projects that use easily obtainable materials and require little adult supervision build on what is taught in each section and include building a shaduf, making a 1:1,000 scale model of the Great Pyramid, cooking flatbread, recreating papyrus, mixing perfume, designing a cartouche using hieroglyphs, and making sandals in the style worn by King Tut. 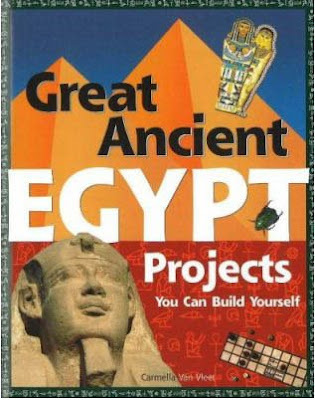 This truly fascinating book makes connections to history, math, and science while focusing mainly on the art and culture of ancient Egypt. There is a wealth of interesting information and clever hands-on projects in this slim book. There is a good timeline of pharaonic history, but most of the text concerns daily life—building boats of papyrus and houses of mud bricks, using the waters of the Nile in ingenious ways to irrigate fertile farmland, making jewelry and make-up, and playing games. For each chapter, there is at least one activity—making a papyrus boat with drinking straws, plastic beads for an Egyptian necklace or amulets, and board games. Many of the projects could help teachers fulfill curriculum objectives without anyone having to fill in spaces on a worksheet, but the activities should definitely be tried ahead of time. Many will take longer than the 20—30 minutes suggested in the text, and some of the ingredients will be unfamiliar. A recipe for date candy, for example, calls for cardamom seeds, which are actually large pods and need to be ground for use in most food. The sepia-colored printing and the variety of fonts is often distracting and unappealing, but these are minor problems in an otherwise interesting presentation of an overdone subject. The glossary, index, and additional resources are thorough. download the above zip file and unzip using winzip or winrar program and use any PDF reader software like adobe to view the file.